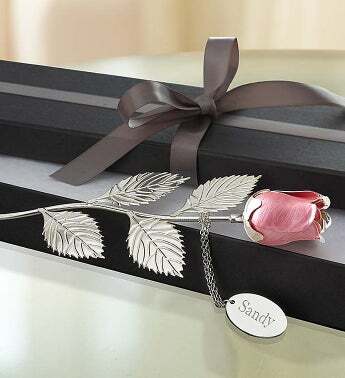 Our elegant personalized rose is a unique and lasting expression of love. “This gift was inspired by the brightly-colored painted enamels sold in the quaint gift shops of the Piazza San Marco in Venice,” says Valerie from our Product Development team. It comes with a metal hangtag, which you can choose to have engraved with a custom name or message, creating a beautiful keepsake they’ll cherish forever.